The safety of having an additional 20% improvement in brake performance. - Delivered with Swiss homologation Certificate! 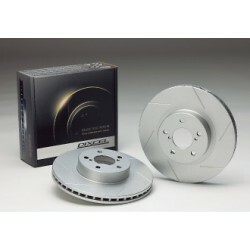 Simulated testing of both the SD and PD discs in the same conditions show a increase of brake performance by up to 20%. With a 20% increase in brake performance, the driver can drive with more comfort and safety. 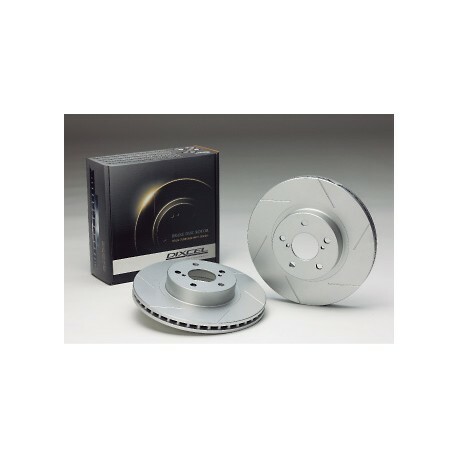 After careful consideration of various factors such as pad wear, noise level, and gas ventilation, 6 slots was adopted as a standard for SD brake discs. The best width, angle, and depth of the slots were chosen using the data from various races and road tests. For the 6 slot brake discs, reverse rotation (slots pointing forward) is recommended for a better brake performance. By offsetting the slots on the inner and outer side of the disc, an improvement in brake modulation was achieved. 12 slot version (SDT type) is available upon request as option. The above chart represents evaluation values of our product in 100 phases in comparison with genuine rotors of the test model. Values of genuine rotors show 50. The values above should be only used as a reference to better understand the performance differences. Higher values signifies the performance increases when compared to the standard disc. The performance difference between forward and reverse rotations. The slots are effective in both forward and reverse rotations. The reverse rotation has a higher friction level compared to forward rotation. But the downside is that the pad wear rate is higher for reverse rotation compared to forward rotation. Please look at the chart below to see the comparison between forward and reverse rotations. The data above is based on our Z type pads. This test data is from testing on the street and race circuit. The values can vary depending on the pad material. Pad wear level also depends on the usage. At DIXCEL, we evaluated each disc's characteristics. To achieve a high level of friction, we recommend the following uses. For discs with 6 slots, we recommend reverse rotation. For discs with 12 slots, we recommend forward rotation. The two-piece brake discs come in 6, 8, and 12 slots. Please use the discs in reverse rotation NOT forward rotation. 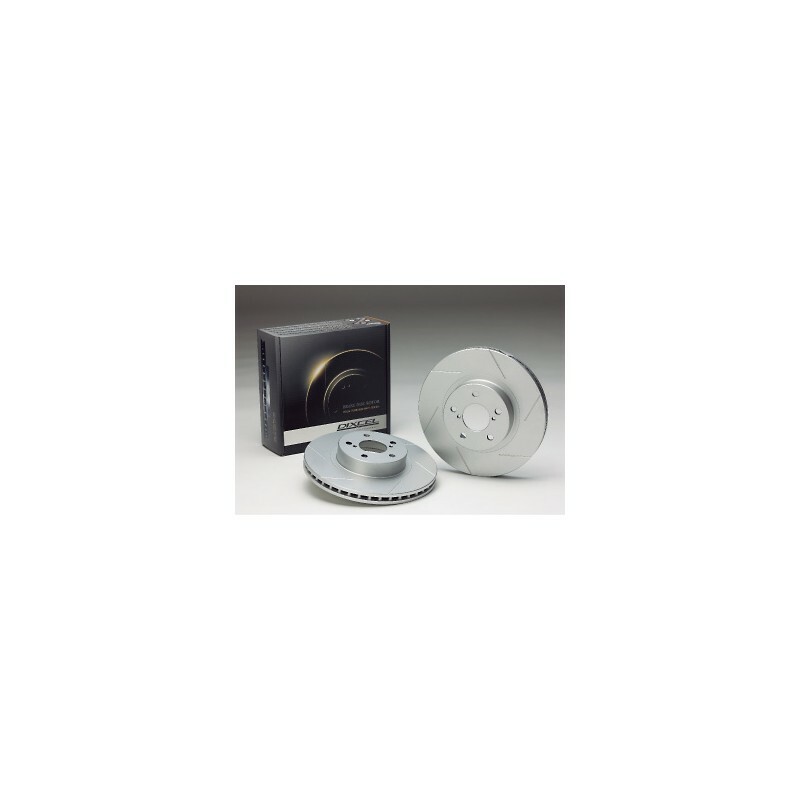 For one-piece discs with directional ventilation, please install in the forward rotation since reverse rotation will be harmful to the cooling effects. 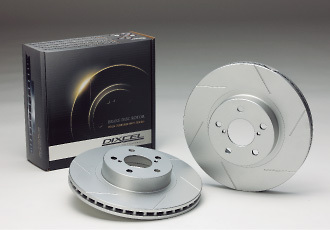 The DIXCEL SD series discs are for the users who want more braking power and better disc appearance when compared to their standard disc. Ces disques sont très valorisant autant niveau freinage que niveau visuel, autant performants à chaud qu'à froid. J'en suis très satisfait ! En combinaison avec les plaquettes Z c'est le must !